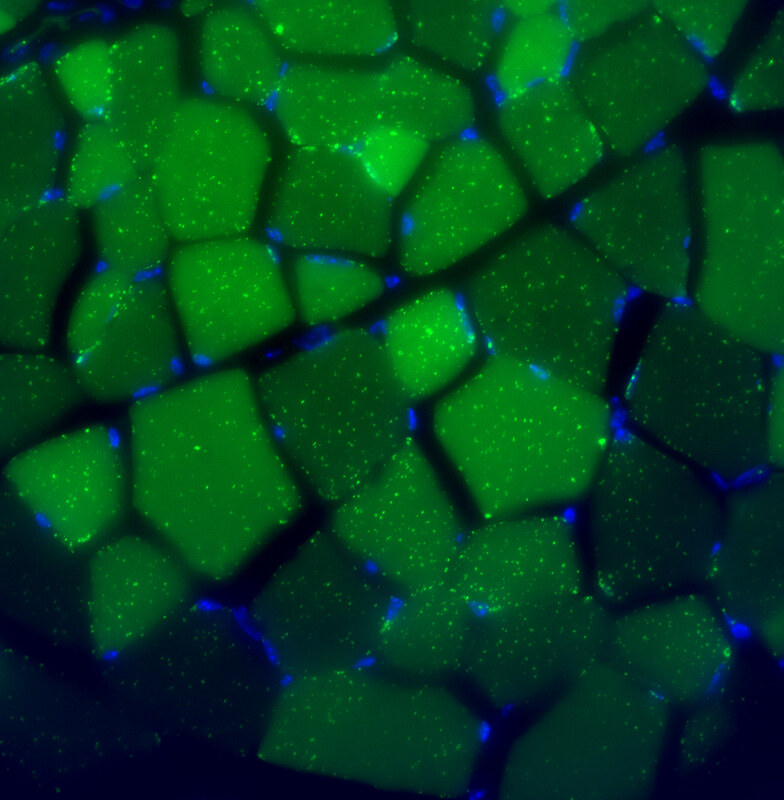 Fasting for 24 hours induced dramatic formation of autophagic vesicles (green dots, labeled by a marker protein LC3 tagged with the green fluorescent protein) in skeletal muscle. Blue indicates stained nuclei. Mice engineered to more quickly recycle their own cells lived longer than their non-engineered siblings, according to a study published in Nature. These findings suggest that autophagy, the system of cell recycling and housekeeping, may be responsible for functional declines associated with aging, according to CongCong He, PhD, assistant professor of Cell and Molecular Biology and a co-author of the study. In fact, reinstating higher rates of autophagy may be an effective way to treat aging-related diseases. Autophagy is an essential cellular mechanism that plays a key role in a number of processes: removing long-lived and misfolded proteins, clearing damaged organelles and regulating growth. A major regulator of autophagy is a specific protein, Beclin 1. In normal organisms, Beclin 1 is only released and activated under certain stress conditions, such as a lack of nutrients or oxygen. Release of Beclin 1 triggers autophagy, recycling dysfunctional cells and hopefully ameliorating the stressors that triggered the process in the first place. In a previous study, scientists from He’s team generated mice models of Alzheimer’s disease with a single mutation in Beclin 1, causing high rates of autophagy in a variety of tissues, prolonging lifespan and enhancing cognitive function in the Alzheimer’s disease mice. In the current study, scientists generated normal mice with the Beclin 1 mutation, finding they also had prolonged lifespan, in addition to delayed aging in the heart and kidney. 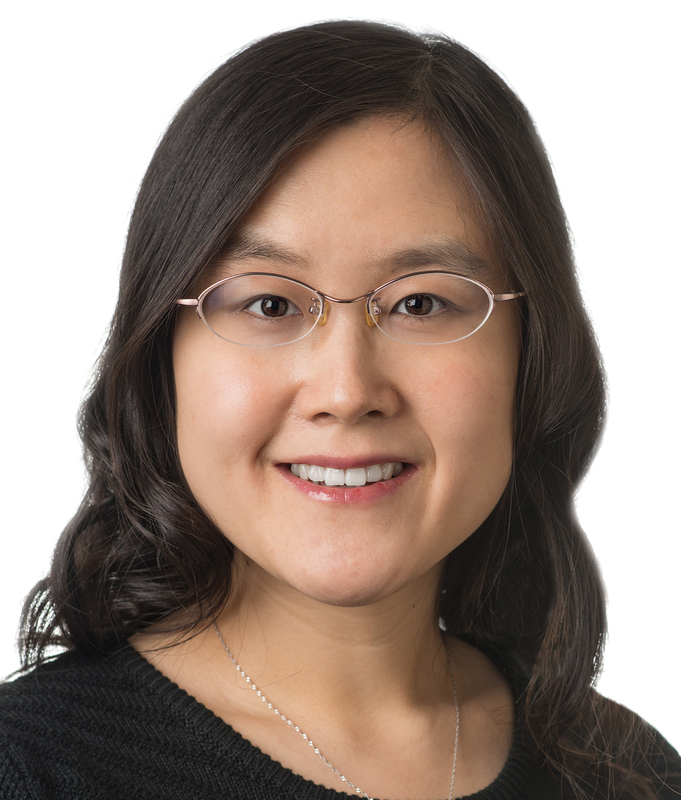 CongCong He, PhD, assistant professor of Cell and Molecular Biology, co-author of a study published in Nature, senior author of a paper published in Cell Reports and a member of the Robert H. Lurie Comprehensive Cancer Center of Northwestern University. The next step towards a patient therapy is to search for drugs that can induce autophagy, according to He. “Age-related diseases, such as Alzheimer’s disease and type 2 diabetes, reduce not only the quality of life of patients, but also the well-being of family and society. Thus, we’re pursuing a way to improve both lifespan and healthspan in aged populations,” He said. The study was supported by National Institutes of Health grants RO1CA109618, U19AI199725, RO1DK091392, RO1DK092461, P30DK07938 and K99R00DK094980; Cancer Prevention Research Institute of Texas grant RP120718 and Fondation Leducq grant 15CBD04. Autophagy may show benefits, but it isn’t a cure-all: inducing autophagy in mouse models with type 2 diabetes improved insulin sensitivity but at the same time impaired insulin storage, according to a separate study from He’s team, published in Cell Reports. The authors suggest that intermittently activating autophagy — rather than chronic activation — should be considered while developing therapies for diabetes. “Translationally, we should be cautious about activating autophagy in beta cells due to its impact on insulin production,” said He, senior author of the study. In the current study, Northwestern Medicine scientists induced diabetes in mice with a high-fat diet challenge, finding that the mice with high autophagy had improved insulin responsiveness, attributed to reduced organelle stress. However, the scientists also found these mice had reduced insulin secretion and storage, compared to mice with normal levels of autophagy. Intermittent activation, on the other hand, may give some of the insulin response benefits of autophagy without the consequence of reduced insulin storage, according to He. Other Feinberg authors include Soh Yamamoto, PhD, a former postdoctoral fellow in He’s laboratory and first author of the study; Nan Wang, PhD, a former postdoctoral fellow in He’s laboratory; Weiran Zhang, a former technician in He’s laboratory; and current He laboratory members Kenta Kuramoto, PhD, a postdoctoral fellow and Xiaolei Situ, a graduate student. The study was supported by National Institutes of Health grants R01DK113170, R00DK094980, R01DK104927 and K01DK115525; the University of Chicago DR&TC P30DK020595; the Department of Veterans Affairs VA merit award 1I01BX003382; the Uehara Memorial Foundation and the National Natural Science Foundation of China grant 31171303.